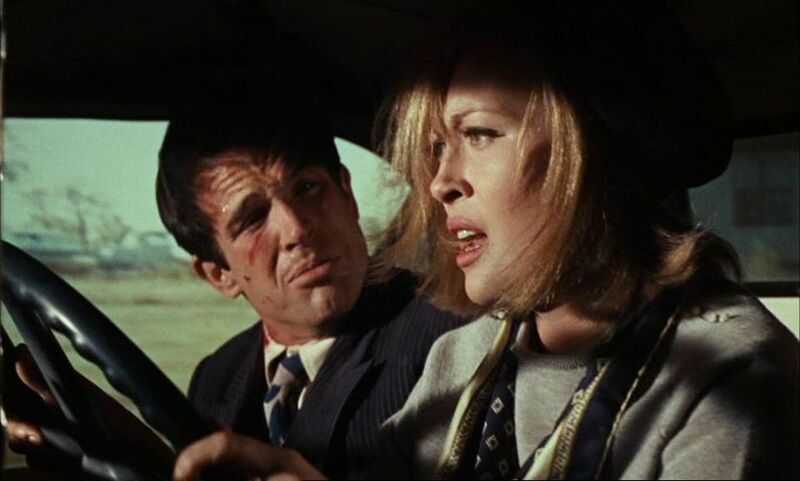 Bonnie and Clyde (1967) was a landmark American film that uniquely combined European art-house aesthetics with mainstream Hollywood cinematics. This commingling of styles, along with problems ascertaining just what the film actually stood for, confused audiences and critics at first. But it ultimately rocked the American film scene and became a critical and box-office smash. Actually, the perceived Hollywood/Art-House combination was founded in the script, because scriptwriters David Newman and Robert Benton were big fans of French New Wave (Nouvelle Vague) films, particularly Jean-Luc Godard’s Breathless (1960) and Francois Truffaut’s Shoot the Piano Player (1960). Newman and Benton initially shopped their finished script around – first to American Arthur Penn (who first declined because he was already busy with another project), and then to Truffaut, and then to Godard. But for various reasons nothing came of these negotiations. Eventually Warren Beatty bought the rights to the script and, after further shopping around, finally convinced Arthur Penn to be the director. The story of the film concerns the somewhat fictionalized account of two real-life outlaws, Bonnie Parker and Clyde Barrow, who achieved widespread notoriety for their crime spree in the central United States during early 1930s. This was the period of the Great Depression, when banks were commonly perceived by the dispossessed poor as tools of the wealthy extractive coalition (a phenomenon that, of course, has always persisted). So daring bank robberies by poor folks like the Barrow Gang took on the proportions of heroic myths. In fact Clyde Barrow preferred to rob smaller stores, rather than banks, but in the public’s eyes, they were celebrated specifically as heroic bank robbers and were seen as a modern-day version of Robin Hood’s gang. "It is a cheap piece of bald-faced slapstick comedy that treats the hideous depredations of that sleazy, moronic pair as though they were as full of fun and frolic as the jazz-age cutups in Thoroughly Modern Millie. Such ridiculous, camp-tinctured travesties of the kind of people these desperados were and of the way people lived in the dusty Southwest back in those barren years might be passed off as candidly commercial movie comedy, nothing more, if the film weren't reddened with blotches of violence of the most grisly sort." "This is pretty clearly the best American film of the year. It is also a landmark. 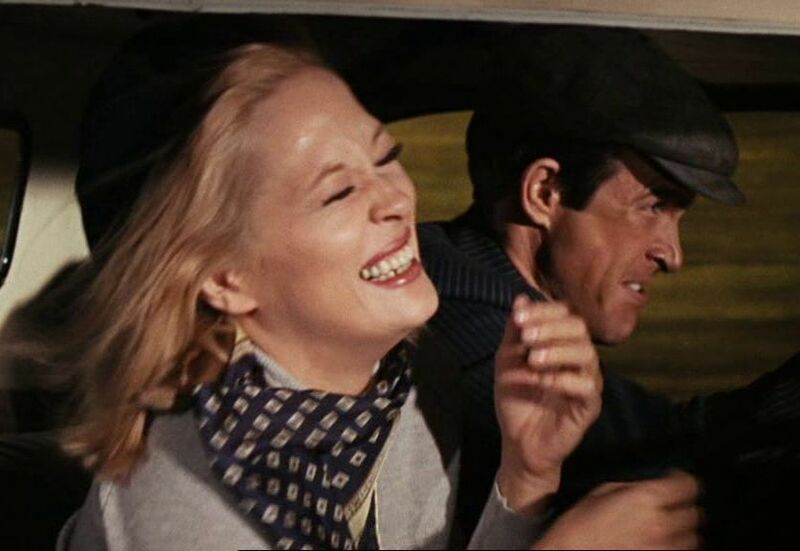 Years from now it is quite possible that Bonnie and Clyde will be seen as the definitive film of the 1960s . . ."
Soon the movie became a smash hit and by the end of the year was nominated for 10 US Academy Awards . The naysayers did have a point, though, and I will return to this issue below. Whatever one’s overall evaluation of the film may be, there is no doubt that the film’s production values were high. Penn’s stage theatrical experience was probably instrumental in bringing out memorable acting performances. In fact a number of actors who got their first major public exposure via this film went on to successful careers, including Faye Dunaway, Michael J. Pollard, Gene Hackman, Gene Wilder, and Estelle Parsons. And interestingly, many people still remember those actors mostly for their performances in this film. In addition the film editing (for which Dede Allen won an Oscar) and the cinematography were outstanding. Those factors gave the film polish, but what ultimately made it fascinating was Penn’s intermingling (via Newman’s and Benton’s script) of existentialist themes (perhaps inspired by French New Wave films) with more traditional American social themes. This was brought about by the elevated significance of the relationship narrative in this film. It is often the case that a film will have two narrative threads – one narrative associated with external events and another narrative associated with the relationship between two principal agents. Usually the relationship narrative is secondary and supportive of the main external narrative. But here in Bonnie and Clyde the relationship narrative (RN) ascends to primacy, with the external narrative (EN) receding and then intervening in bursts of violence. So we can examine these two narrative threads separately. The external narrative concerning the violent criminal exploits of Bonnie Parker and Clyde Barrow covers their life on the run as outlaws. It does so by vividly contrasting the American (US) cultural traditions of glorifying guns and outlaws with the brutally violent consequences to which those traditions lead. Americans possess far more guns per capita than any other country, and this leads to far more homicides than, for example, European countries where the gun possession rate is lower . But Americans have always had a love affair with guns and like to point to the fact that gun possession is enshrined as a right in the US Constitution. In addition, Americans, in common with many people, tend to have a romantic image of outlaws who manage to defy the authorities and escape incarceration. There is a long tradition of celebrating notorious outlaws such as Jesse James, Billy the Kid, Butch Cassidy, John Dillinger, Baby Face Nelson, Pretty Boy Floyd. Bonnie Parker and Clyde Barrow are also members of this club . Although the real Clyde Barrow was evidenetly a ruthless killer, he is presented in this film in a softer and more sympathetic form. Yet when the killings take place in the film, there is no reservation and the bloody violence suddenly splashes across the screen. This back-and-forth contrast between the romanticized images of the outlaws and the explosive moments of carnage is one of the features of the external narrative. The external narrative (EN), which opens suddenly with no backstory and terminates just as quickly, can be seen to pass through three phases. In the first phase, Bonnie Parker (played by Faye Dunaway) is shown lying in her bed and bored with her mundane life. Looking out of her upstairs window, she notices a young man, Clyde Barrow (Warren Beatty) attempting to steal her mother’s car. Mischievously excited, she comes down and banters with Barrow and is immediately captivated by his charming bravado. She dares him to make a robbery in town, and he immediately does so, after which he steals a nearby car. Thrilled by what she has witnessed, she jumps into the car and immediately starts covering him with kisses while he drives. So from the outset we see what Bonnie and Clyde want: he wants to be a daredevil thief with a trophy glamour girl, and she wants to be with a man who can give her constant excitement. After some more robberies, they recruit a mousy, but capable, teenage boy, C. W. Moss (Michael J. Pollard) to be their driver, and they rob another bank. On this occasion, CW’s poor driving messes up their getaway, and Clyde shoots and kills a man who had hopped onto their car as they drove off. At this point, Clyde is now a murderer and presumably will become known to the police. In the second phase, Clyde hooks up with his brother Buck (Gene Hackman) and his wife Blanche (Estelle Parsons), and they make plans to roam across the central US states and rob banks. They pull off a number of robberies during this phase. In the process there are several violent shootouts with the police, but they manage to escape on each occasion. These escapes were facilitated by their crossing state lines, which took them into another police jurisdiction and out of the legal range of their police pursuers. They also capture a Texas Ranger, Frank Hamer (Denver Pyle), who had been following them, and they taunt him by using their Kodak camera to take humiliating “selfies” with him. Throughout this period, the Barrow Gang is gaining notoriety in the press, and the gang revels in their daring and breathtaking undertakings. While stopping for the night in Platte City, Iowa, they are recognized by a customer, who notifies the police. That night an armada of police cars ambush the motel, and a violent shootout takes place. Buck is mortally wounded, and his wife is blinded by shattering glass. 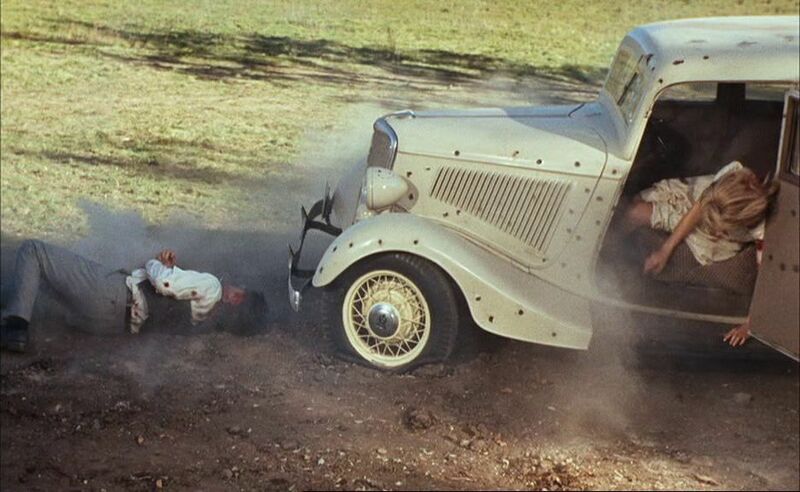 Bonnie and Clyde are both wounded, but somehow they and CW manage to escape the scene in another stolen car. 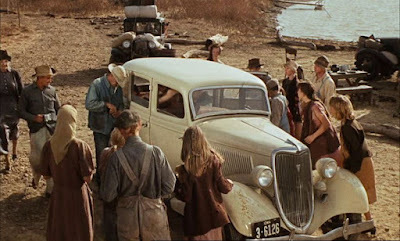 On the road again, CW stops their car at an impromptu camp for the dispossessed and asks for some water. The poor people there recognize Bonnie and Clyde and show quiet reverence for people that have been defying the brutal system that has left them desolate. Then CW takes them to the home of his father, Ivan Moss. Ivan graciously puts them up, but secretly he goes to meet Frank Hamer, who has all along been trying to track down Bonnie and Clyde. Ivan arranges with Hamer to betray Bonnie and Clyde in exchange for a light prison sentence for his son, CW. Some days later, when Bonnie and Clyde are driving back home from the town, they are tricked by Ivan Moss into stopping their car, whereupon they are massacred by a fusillade of bullets from police hiding in the bushes. With that the film comes to an abrupt halt. 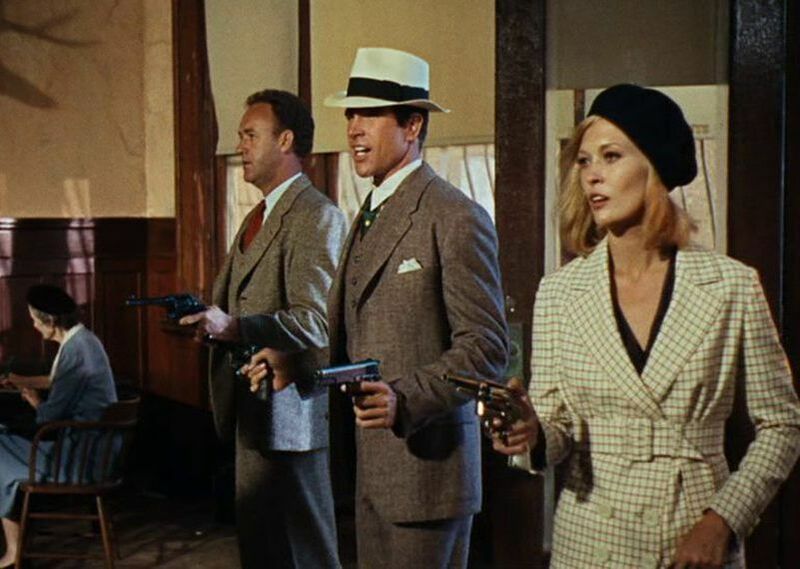 Throughout this external narrative Bonnie, Clyde, and Buck are portrayed as relatively innocent, fun-loving characters who just happen to rob banks. When they kill people, it is usually in the midst of firefights when their own lives are in danger. 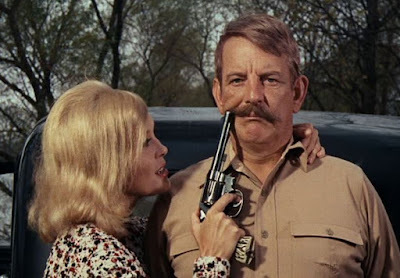 By contrast, Texas Ranger Frank Hamer and Ivan Moss are shown as particularly unlikable and odious – they are unprincipled, oppressive, and devious. The viewer’s sympathies have been steered towards the Barrow Gang, even though they are notorious outlaws. So much for the external narrative, which roughly follows the known facts about Bonnie and Clyde’s activities. It is the relationship narrative (RN), however, which incorporates the existentialist themes that make the film stand out. Again there are three phases that roughly overlap with the external narrative. Early on when Bonnie madly kisses Clyde after his first holdup, Clyde becomes distressed and warns her that he is not a lover boy. So from the beginning we have an insight into Clyde’s personal anxieties. Bonnie is humiliated to have her advances repulsed, but she persists in her admiration of Clyde. Later, after Clyde committed his first murder, he tells Bonnie that she is still unknown to the police and that she can return to her home. But Bonnie refuses; she is in love with Clyde. Her demonstrative love for him inspires Clude to try to make love to her, but he is impotent and humiliated by his inability to do it. Again she stands by him, even then. So now both Clyde and Bonnie have suffered extreme personal humiliation and self doubt. In the second phase of the film, Bonnie wants to spend some time alone with Clyde, but finds herself cooped up with the rest of the gang. Buck is jocular but boorish; CW is simple-minded; and Blanche perpetually nags and complains in shrill tones. We can see that Bonnie is more refined than that – she spends some of her time writing poetry, such as the “Story of Suicide Sal” . She evenetually grows weary of life on the run and finally runs away from them all. But in an ominously cloud-beset field, Clyde finds her and agrees to take her to visit her mama. “When we started out, I thought we was really going somewhere. Upon hearing that heartfelt tribute to their togetherness, Clyde’s self doubts dissolve at last, and he is able to physically consummate his relationship with Bonnie – which gives her the reassurance that he truly loves her. They have finally attained bliss just before they die. 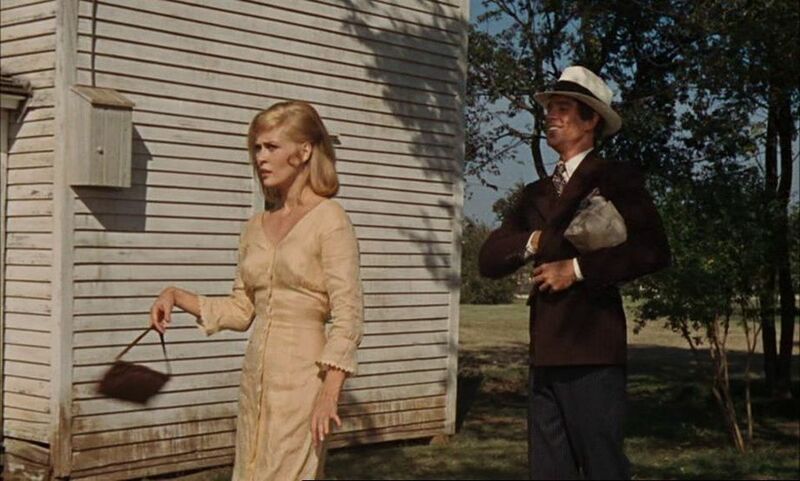 The two narratives of Bonnie and Clyde move through different and contrasting arcs. The external narrative arc moves upward at the beginning and reaches its peak in the middle of the story. Then it comes crashing down to the depths at the end. The relationship narrative arc starts out with early promise, but then soon moves downwards to a low, before rising up to a high point at the end. But overall, Bonnie and Clyde’s juxtaposition of contradictory narratives manages to mirror our own precarious existence. We continually construct romanticized narratives of our own lives that feature humanized goals of fulfillment, but these narratives are constantly being interrupted by brute events that often violently disrupt our fantasized stories. Then we get back on the road and start anew and build up another story. Bonnie and Clyde takes this process to extremes and reminds us of our limits. We basically knew from the outset that Bonnie Parker and Clyde Barrow were doomed. But we became immersed in their impossible world and followed along with them. And when they finally became united in their love, well, . . . what more could they have achieved? Bosley Crowther, “Bonnie and Clyde”, The New York Times, 14 April 1967. Roger Ebert, “Bonnie and Clyde”, RoberEbert.com, 25 September 1967. 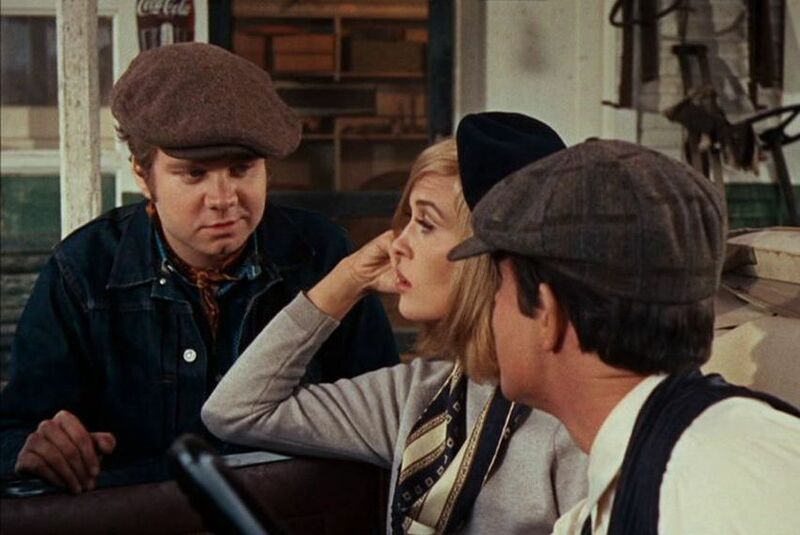 Roger Ebert, “Bonnie, Clyde and the Critics”, RogerEbert.com, 10 December 1967. The following year Bosley Crowther was dismissed as the regular New York Time film critic, and it was widely believed that the reason for his removal was his misreading of Bonnie and Clyde. The US population possesses 88.8 guns per 100 residents, while in the UK there are 6.6 guns per 100 residents, see “Number of Guns per Capita by Country”, Wikipedia, (21 August 2015). Note that Baby Face Nelson, John Dillinger, Pretty Boy Floyd, Clyde Barrow, and Bonnie Parker were all killed by law enforcers in the same year, 1934. Bonnie Parker, “The Story of Suicide Sal”, (1932), About Education. Bonnie Parker, “The Story of Bonnie and Clyde”, (1934), About Education. Thanks lot for sharing .